I posted this on the art center blog a few days ago, forgot to put it up here. 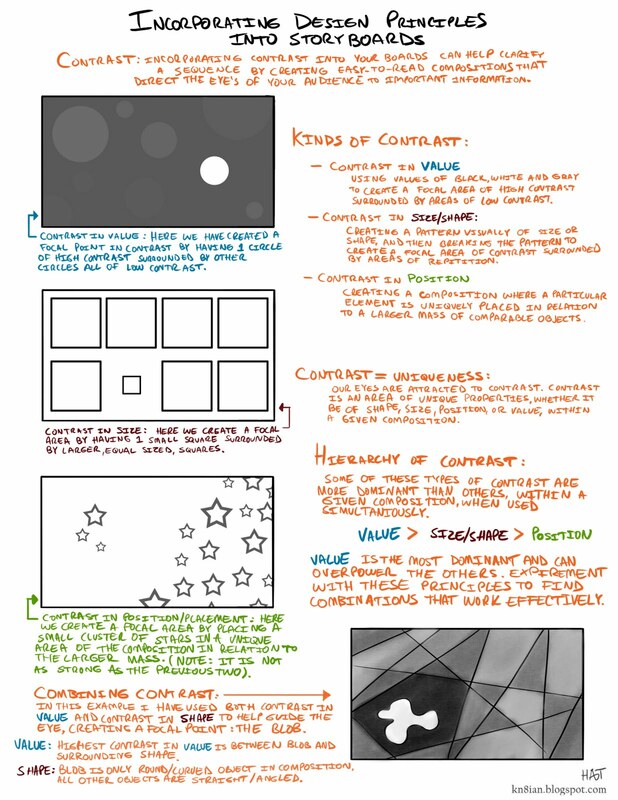 These next few tip sheets examine the elements of design; line, shape, space and value, and how to incorporate them into your storyboards to help direct the eye and clarify information. 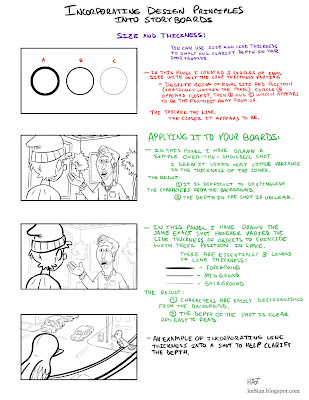 The focus here is not the cinematics of stroyboarding but the execution of idea to paper and ultimately how to utilize design principles to achieve desired results in an efficient way within a given panel or shot. 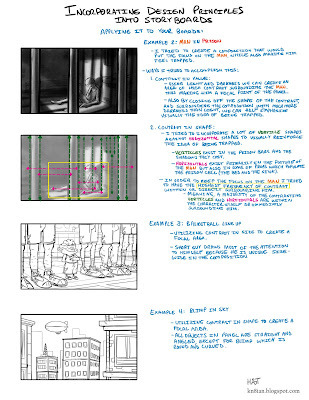 Storyboarding is not necessarily about drawing 'good' but drawing effective. NOTE: There are two other elements of design, texture and color. However they would only be used in rare cases with storyboards and when employed probably wouldn't be for design purposes but most likely for clarification (I.e. using colors to keep track of specific objects of similar size and shape in a given sequence, such as stones or gems, that each have varying story-specific trajectories). Below are a few examples of how incorporating varying line thickness into a panel can help clarify not only the information presented, but the depth of the shot. There are many things you can do within a given panel to help focus or direct the eye to the important information. A simple way to achieve this is through contrast. Contrast can exist in many forms, and below we look at how contrast within a specific design element (shape, space, value) can create a focal point. Now we can take these principles and incorporate them into storyboard panels. I got a bit 'wordy' on the tip sheet above. 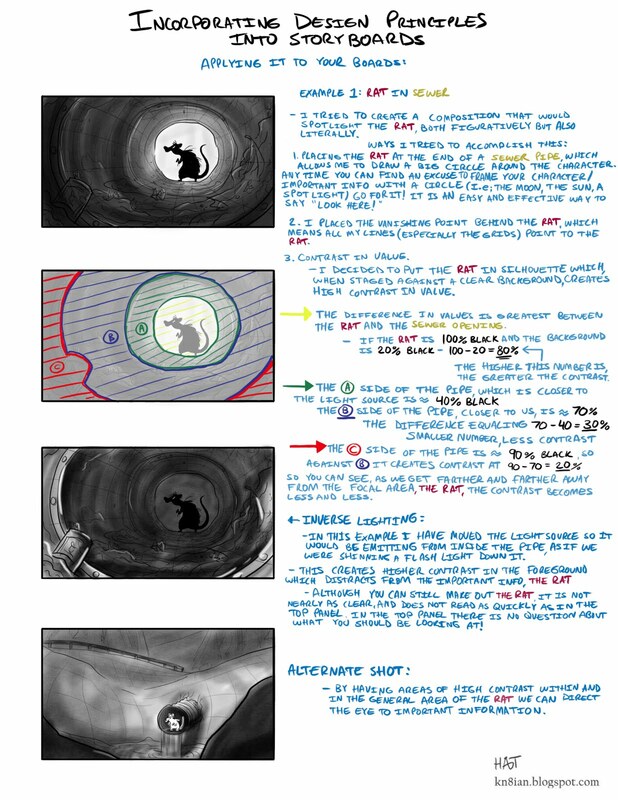 I think the most important thing to take away from the sewer-rat example above is realizing that even though panel 1 and 3 are the exact same compositions, the shading can either greatly enhance (1) or greatly distract (3) from the important information. This holds true of the other design principles as well. Thinking about these principles while you are boarding can help in creating clear and easy to read compositions. 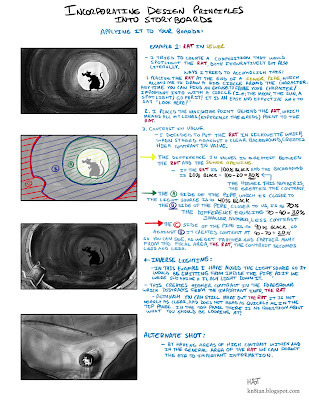 There is no single 'right' way to present an idea visually. The 'blimp' idea, for instance, could easily be boarded successfully in a variety of different ways. Ways that would vary in stylistic choices based on the artist, but that could all achieve the same goal of focusing the attention on the blimp. In fact there are probably compositions that could be more successful than the one presented. So start experimenting with design principles and find ways to incorporate them into your boards that work for you. As per my previous posts, I reserve the right to be wrong. These are simply tricks and tips I've picked up along the way that I've found to be successful in my own work. Great post, thanks Hat! You touch on some really great points here. Those side by side examples are such a great reminder about the importance of clarity and guiding the eye. Rock on! Another great post! I always enjoy reading these. 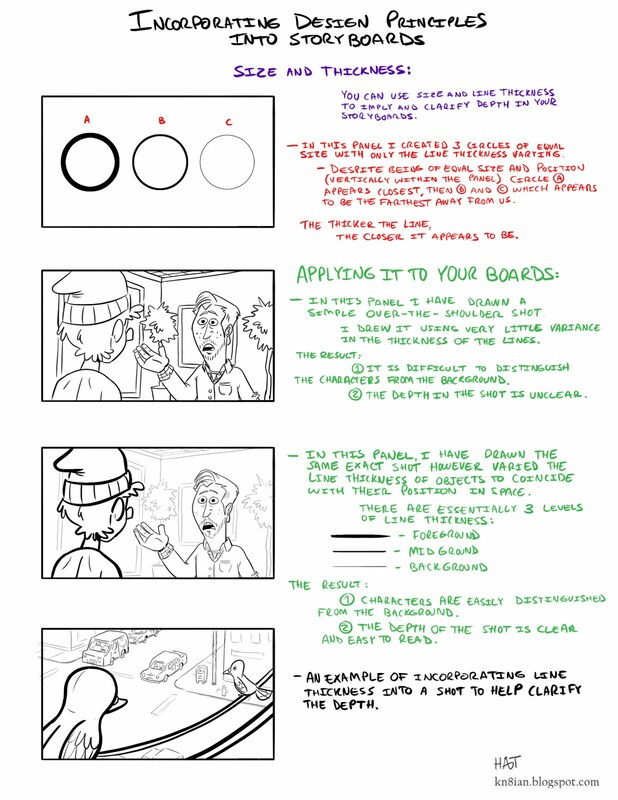 Are there any specific tips you can give for doing Comedy storyboards?